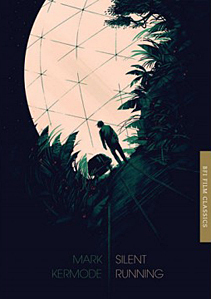 SILENT RUNNING (Douglas Trumbull, 1972) is probably my all-time favourite film. Its central theme is that man, even at the risk of madness, must be his own saviour. 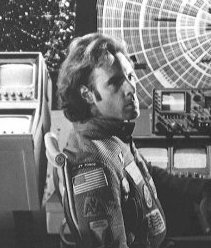 Bruce Dern stars as Freeman Lowell, adrift in the spaceship "Valley Forge", part of a fleet of ships which are in essence a Garden of Eden. Each ship has attached a number of huge domes, like sophisticated greenhouses, each one housing a different flora and fauna. These were intended to refurbish an Earth devastated by nuclear war. Lowell is in constant disagreement with his three fellow crewmembers - they simply don't care about the domes, or share any of his ideology. It is left to Lowell to care for the plants, helped by the three small drones Huey, Dewey and Louie. Then an order is received from Earth - destroy the domes and return. This is the turning point of the film - Lowell must stand up for what he believes is right. The other crew members attempt to jettison the domes, and in trying to prevent this, Lowell ends up killing them. He then takes the Valley Forge away from the main fleet, with a flight through Saturn's rings: thus begins his battle for the survival of the last of Earth's flora and fauna. He has to rely upon the drones more and more, and is devastated when one is blown away while working on the outside of the ship. He takes the remaining two back out to where the third was lost, haranguing them to be more careful. The drones are almost human in their actions and responses; we see them look sadly at the severed foot of their colleague stuck to the ship's superstructure. This is reinforced by their gait - they don't roll or glide smoothly, they waddle! Eventually, the other Earth vessels track down the Valley Forge, and believing Lowell to be in trouble, want to mount a rescue attempt. Of course - the domes must still be destroyed. Lowell knows he cannot continue, and rigs the Valley Forge to blow. His last act is to jettison the remaining dome, sending it out into space to seed a possible second chance for mankind. The final images are some of the most powerful seen in science fiction films, both sad and optimistic: the forest tended by the remaining robot, with a battered watering can, all alone. This is a wonderful film, which never relies on effects to tell the story. The human aspect is always paramount. It is a must-see for any science fiction fan. This Silent Running tribute page has been online since 1996-7, now updated and expanded in 2016. Any links to commercial sites are for information only, are not an endorsement & do not earn us commission. Last update July 16th 2016.